At a glance | Panchkula | Tourism Hubs | Haryana Tourism Corporation Limited. Panchkula is a well planned city in the Panchkula district, Haryana. It forms a part of the tri- city area i.e. Panchkula, Chandigarh and Mohali. The city hosts the Chandimandir Cantonment which is the headquarters of the Western Command of the Indian Army. The city is well designed with systematic layout, wide roads adorned with beautiful tress and buildings that compliment the modern outlook of the planning. The district of Panchkula is also famous for its natural beauty as it enjoys thickest forest cover in the entire State of Haryana. 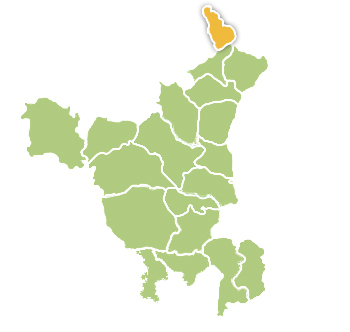 Besides Panchkula city, the district has five towns, Pinjore, Kalka, Barwala, Morni and Ranipur Rani. Morni Hills, a much sought after tourist destination, is the only hill station in Haryana. It is located on the offshoots of Shivalik Range of the Himalayas and is known for many picturesque spots for sight-seeing. The origin of the name Panchkula came from the place where five irrigation canals meet. Panch is five and Kuls means canal, hence the name Panchkula. The canals take water from the Ghaggar and distribute it from Nada Sahib to Mansa Devi. The canals, build by a ruler in the past are a good example of ancient engineering acumen, as at some spots the water is raised to higher levels than the river course. Location: Panchkula is just 10 kms. away from city beautiful Chandigarh & is an important part of the Tricity. Linking Roads: Panchkula is located on the Ambala-Shimla National Highway No.-22. Panchkula is also connected to national highway National Highway NH-21 and is directly accessible to National Highway No. 73. Postal Code: 134109 | Longitude: 76° 52' 48" E | Latitude: 30° 42' 00" N | Area: 816 square kilometres (315 sq mi) | Altitude: 365 m | Population: 558,890 (Census 2011) | Literacy Rate: 83.40 | STD Code: 0172 | Villages: 264 | Language: Hindi, English | Best season to visit: All seasons to visit. The nearest airport is at Chandigarh, which is about 12 kms. from the town. For more information please contact the airlines. Panchkula, which is near Chandigarh is well-connected with all parts of the country by rail network. There are daily trains to Delhi, which connect to all parts of the country. For railway enquiry dial 139. Haryana Roadways buses connect Panchkula with Delhi, Chandigarh and other important places in Haryana, Punjab and Himachal Pradesh. For Haryana Bus Enquiry at Panchkula : dial 0172-2562200. Chandigarh Inter-State Bus Terminus is located in Sector 17, which is 17 kms. from Panchkula. It has excellent bus services that connect the town to Haryana, Punjab and Himachal Pradesh.